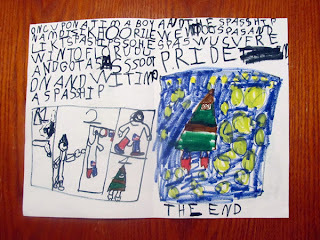 Yesterday, Curly, aged 6, got it into her head to write and illustrate a book. This idea did not come from me, nor did she have assistance in the effort. I will attempt to translate the text and describe the images to the best of my ability. 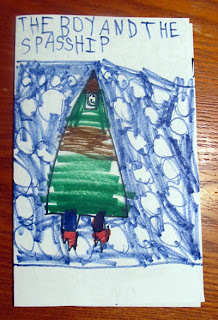 "The Boy and The Spaceship"
Image: Boy in rocket-shaped green spaceship set against a blue field set with round stars. "Once upon a time, a boy named Isaac who really liked spaceships, so he went to Florida and got a spacesuit on, and went into a spaceship." Images: Sequence. 1) map of Isaac traveling to Florida. 2) Choosing a space suit. 3) Wearing the Space suit. 4) In the space ship. 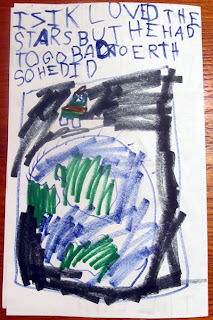 "And the spaceship went to space, and space was very pretty. The End." Image: Green spaceship set against a blue field with round yellow stars. "Isaac loved the stars, but he had to go back to Earth, so he did." 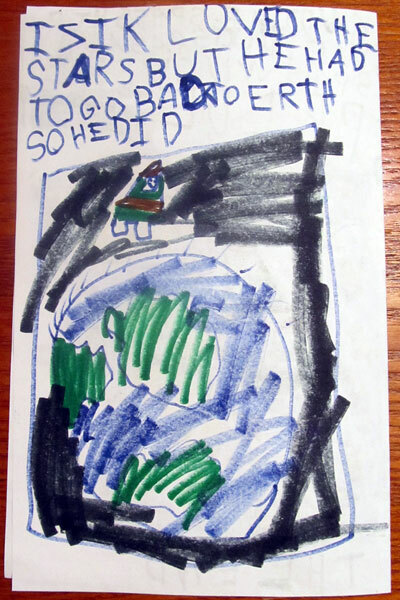 Image: Isaac's spaceship standing atop the round globe-like Earth. I like it! Short, simple, and to the point! So, unlike me, who goes on and on and on....you get the point! Oh, and with colorful pictures that actually resemble something other than scribbling, also unlike me. Come to think of it, I think she might be even more talented than me! I love this illustration of un-schooling. 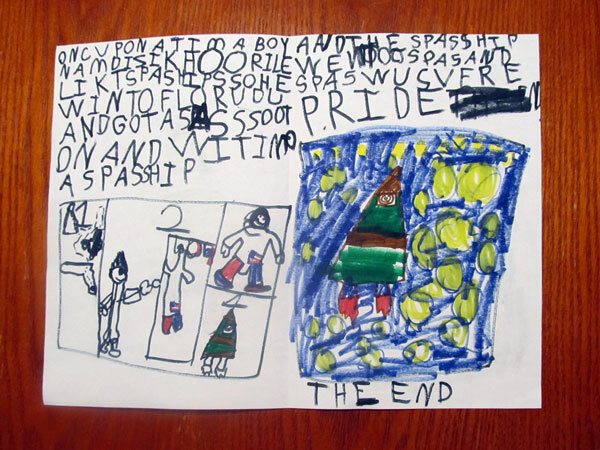 I love that she is confident enough to write, even though all the words are mis-spelled. Thank you for sharing Curly's story with us, your readers.